Kutná Hora and the neighboring town of Sedlec are a UNESCO World Heritage Site. The oldest Alchemy Museum in the world is only one of many fascinating things we find here. One of the most important buildings in the area are the Gothic, five-naved St. Barbara's Church, begun in 1388. You can see its distinctive five spired roof in the first 2 strips. Another world famous location is the Ossuary. 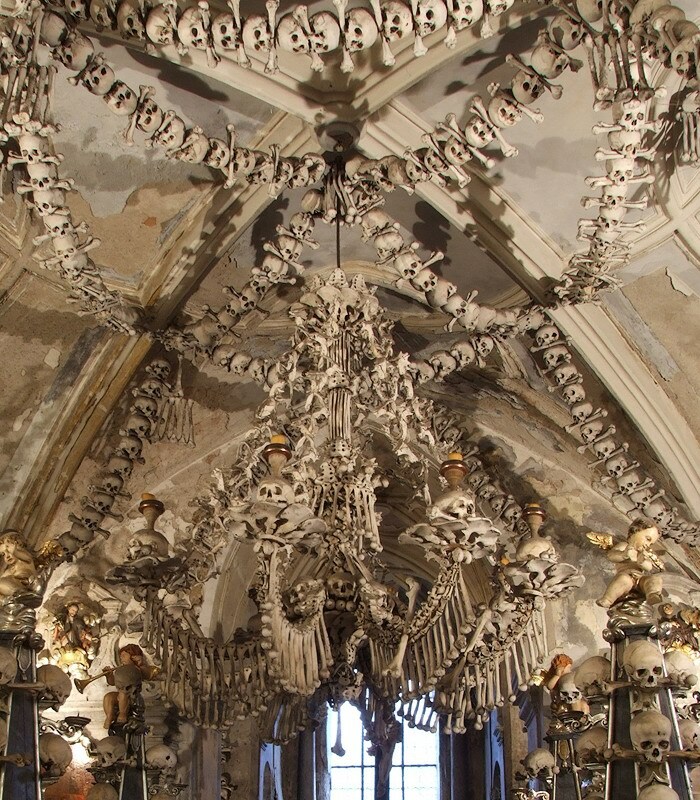 I don't know if we'll visit the Bone Church in this story, but if you happen to be passing near Prague, i highly recommend the side trip. See, back in the late 13th century, King Otakar II of Bohemia sent Abbot Henry to the Holy Land. When the good abbot returned, he brought with him a pot of earth from Golgotha, which he sprinkled over the cemetary. Word of this spread, and soon it was seen as holy land in its own right, and people all over Europe wanted to get buried there. Things were booming right along until that pesky Black Death dropped in to visit. Now suddenly, we've got way too many people wanting/needing to be buried, and no place left to put them. Why don't we dig up the bodies, clean 'em up, and use the bones to build a church? Think of it as just moving all the old residents indoors. We're upgrading their accomodations!" Irina Alexandra has a fine page of photos on Weirdomatic to give you a better look around. Once upon a time in China, way back in the Tang dynasty (back in the 600s on the CE calendar), there was a Magistrate named Di (or Dee, if you prefer). Di RenJie worked his way up from a small town magistrate to a key court figure by virtue of his righteous character and his ability to solve seeming unsolvable crimes. A millenium later, in the Ming Dynasty, Di became a popular literary figure, with detective tales written placing the Tang Magistrate into Ming dynasty life. Then, in the middle of the last century, Dutch diplomat Robert Van Gulick translated some of these Ming Dynasty tales, and even went on to write original Judge Dee fiction. Now i could go look up some more accurate info than that top-of-my-head summary. But, no. Instead i've been working on his descendant. Or maybe his reincarnation? We'll see. Magistrate-Under-Heaven Di will be a significant figure from the new Chinese Empire. And his story walks hand-in-hand with that of Gwai WuMei - the "Lovely Ghost", with Sifu T'ien Lung weaving his web between. When it comes to Sifu T'ien Lung, think a mix of Fu Manchu, the Mandarin, and Dr. Fate. Sort of. But sort of not. Up until a few months before our story takes place, New Orleans was held in the grip of the fearful Axeman. For at least the period of 1918-1919, possibly longer, he killed indiscriminately, without stealing from the victims, usually using the victim's own axe or straight razor. Then in March of 1919, he sent his final note to the media, warning that he would strike shortly after midnight on the 19th, but would spare anyone in a place where jazz music played. Came the time, jazz was everywhere - late night clubs were packed and hundreds of private parties raged all across town. The night passed, and he was never heard from again. This is one that's been scratching at the back of my head for a long time, since the start of developing Frank'n'Cindy - Who is the Emperor of China? I always knew i wanted an Emperor instead of the Republic in this world, but how was the Dynastic system still in play? Who would be the new Emperor? Would it be the Guangxu Emperor, having avoided the poison that took his life the day before the Dowager Empress died - continuing the Qing Dynasty? I have to say, i like that one a lot, and it was #2 by an exceedingly narrow margin. The things he tried to do in his young life, he would be finally free to do now - shaping a new China for the new Century. Another obvious candidate was Sun Yat-sen, the first President & founding father of the Republic of China. What if his revolution had sought reform of the Dynasties, instead of an end to them? What new China might he have created? And, of course, there was always the fascinating possiblity of someone totally unknown to history as the new Emperor. A blank slate to work with. Couldn't happen, you think? Ah, but in this world, legends live and old powers still walk this realm. Any number of artifacts might have been used by an obscure monk, scholar, merchant or peasant to seize control from the chaotic times at the beginning of the last century. No, not THAT world. The one in which Experiment Two takes place. Unlike the hidden secrets of the world in Exp. One, the new world is a much more open and accessible place, more easily understood without actually having to have been there. And while we may be just getting started here, the world of Mad Science is one that was already in development for another series of comic stories i'm planning, starring the Frankenstein Monster and Cindrella. But that's, literally, another tale. But that leads us straight into one obvious point about this world - it's populated both by characters from history and fiction. So if Dr. Nick needs to consult, he might pop over to visit Tom Swift as easily as R. Buckminster Fuller. The next item on our Guide To The New World tour - it ain't the history you know. Oh, sure - basically, up to a point. But major divergences begin in the 19th century. When Darwin published his Origin Of The Species and many proclaimed that it was a death sentence for God and religion, the Church got smart about its future. It backed Darwin, saying that the arguement was like discovering a hammer and saying there is no Carpenter, the hammer drove the nail. And that, in point of fact, those who were discovering the tools and rules of God's Universe were doing His work, as He had commanded man to go forth and name all the things of the world, and this could not be done without understanding them. This radical shift in attitude led to a steampunk sort of world by the time we get to our story, which takes place "nearly a century ago". Oh, and there's one other significant factor that might be worth noting. I'm writing it. So it's a weird world, as one might expect. We'll explore this strange new world here in future posts. Learn who the new Emperor of China is. Discover the amazing technology of Dr. Nick and his world. Find historical tidbits and oddities from our world that helped shape this one. So much fun for no admission price!